As we are about to embark on our second December in Indonesia, I give you my top 10 tips for backpacking at Christmas and reflect on what it is like to spend the holidays away from family, friends and the traditional festivities. In 30 years I’ve never known another Christmas. Every year the same script, but each equally as special. Despite its repetitious format, I always relish the day with my family and love our little routine of waking up and comparing stockings with my sisters, lunch at 2, The Queens speech at 3 and then off to our Nan and Grandads. Being away from home and backpacking at Christmas meant I would be breaking the mould of a lifetime, not only for myself, but my family tradition as well. 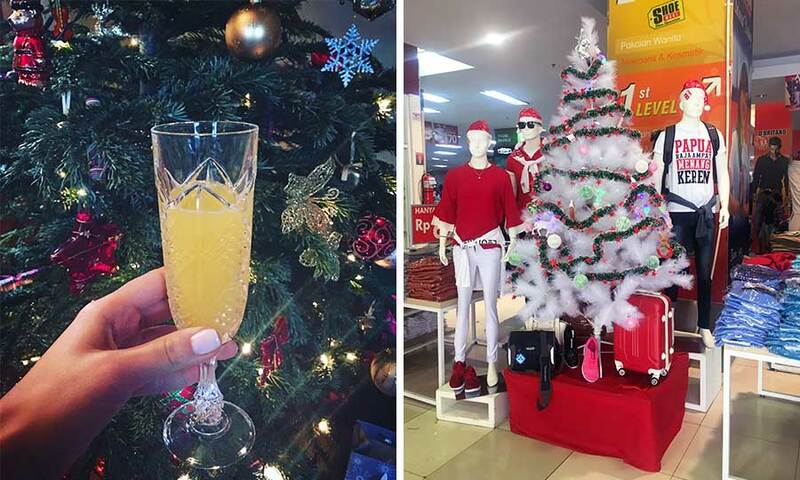 Christmas at home or away? However, after years of working in the jewellery trade, I had to admit I was ready for a change. For the past decade November and December have meant one thing: ‘Tis the season to sell sell sell (or in other words, work work work!) By the time the big day rolled around I’d often find myself sipping on a crystal cut glass of sherry with a sore throat, and a severe case of exhaustion! Despite a tinge of sadness, guilt and FOMO with my family, it felt refreshing to be backpacking at Christmas time with the prospect of experiencing something new and entirely different. It’s not often you get the chance to wake up in an exotic country on Christmas morning – so embrace this once in a lifetime opportunity. The best advice I can give to anyone backpacking at Christmas is, plan something awesome for the day, and be exactly where YOU want to be! Our initial plan was to be in The Philippines, but after a disappointing experience there, we had a change of heart and decided to leave the country early. This left us with a big decision. Where did we want to spend Christmas in South East Asia? Do we stay somewhere luxurious for a couple of nights, go to Thailand and eat loads of great food or just chill out on a beach somewhere? Christmas time is all about feeling homely and being surrounded by comforts. 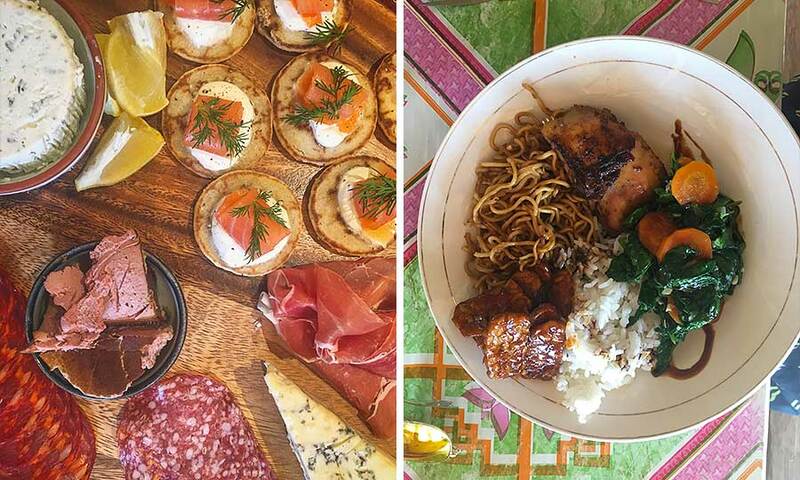 Snuggling up in front of the fire, cosy clothes and delicious food! If these values are still important whilst you’re travelling, I recommend staying somewhere that makes you feel comfortable and at home. Perhaps this means going back to someplace you’ve been before (in our experience, familiarity helps) or if you’re travelling solo, consider staying in a hostel so you can socialise and share the day with others. I was a bit anxious about staying in Raja Ampat over Christmas (it is well known for its primitive conditions) but we made sure to get ourselves booked into one of the better homestays. This was about as close as we’d get to ‘feeling homely’ in somewhere as remote as Raja Ampat. If you’re backpacking at Christmas, the biggest (slash best) present you’ll be getting is the gift of travel! However, I still think it’s important to mark the occasion with a ‘treat to self’ or something thats feels familiar. Whether it’s a couple of beers, watching a Christmas movie, indulging in your favourite chocolate bar, or treating yourself to that bikini you’ve had your eye on, its nice to have something to open on the big day! In December, we did a little Christmas shopping at a mall in Sorong, West Papua. It was bizarre walking in off the hot streets in flip flops and being faced with a big fake tree and a sound system blaring out an Indonesian version of Maria Carey’s ‘All I want for Christmas’. We stocked up on our favourite snacks to share and enjoy together with the local kids on Christmas Day. It sounds ridiculous but I was so excited about having some treats to look forward to. It definitely made me feel more Christmassy! In the Western world we are so consumed by the run-up to Christmas, with all the advent calendars and constant countdowns. 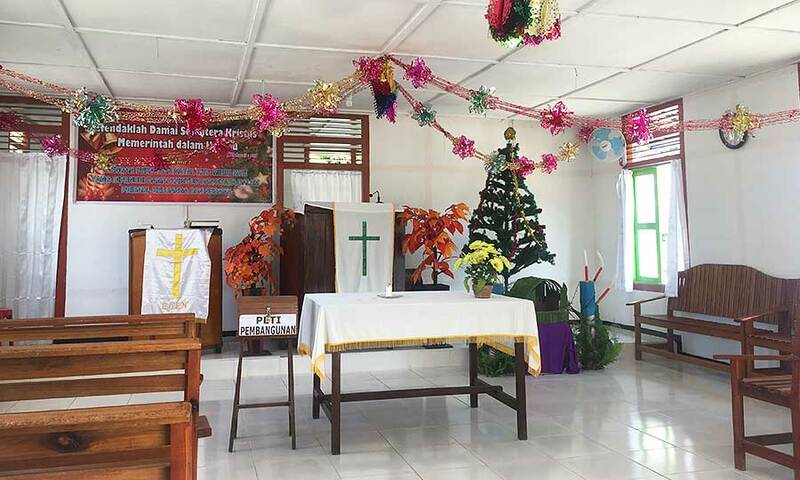 But in West Papua, Christmas Day could honestly pass as any other. The only noticeable difference was that it is treated like a Sunday, a day of rest. To mark the occasion people go to Church, so we decided to join our homestay hosts and celebrate Christmas like a local. The community congregated at 9am for a morning service, they sang songs, prayed thanks and tithed. Afterwards we all shook hands, wished one another a Merry Christmas and then it was back to cooking, cleaning, fishing, while the children played in the sun. If you’re ever lucky enough to experience Christmas in another part of the world, embrace the culture and celebrate it like a local. It showed me a whole other way of life that I didn’t even know existed. 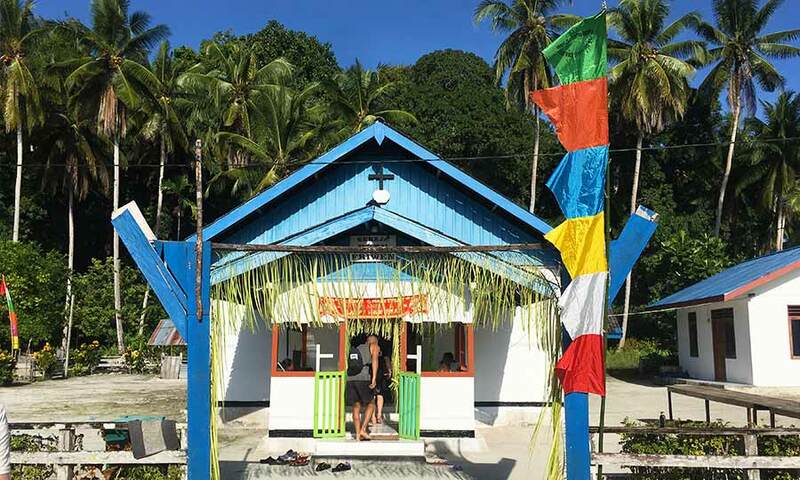 In Raja Ampat, Christmas is all about giving thanks, not gifts. So after Church, we found some local kids and gave out some sweets. Seeing the happiness on their little smiling faces was amazing! This stripped-back approach to Christmas made me unbelievably grateful and thankful for the abundance I’d received over the previous 30 years. One of the hardest parts of backpacking at Christmas is being away from your family and friends. So make sure you are able to contact them – Not just for yourself, but for them too. Your absence will undoubtably be felt back home, but keeping in touch will make things a whole lot easier for everyone. Arrange a Skype call or swap pictures, it will be interesting for everyone to see how you’re spending the day! Being in Raja Ampat for Christmas meant very little contact with the outside world. Thankfully I had just enough signal to send simple WhatsApp messages, but I wouldn’t be able to call home. On Christmas morning, I got up early to watch the sunrise. Our dive guide Maria passed our bungalow. She smiled and wished me a ‘Merry Christmas’ and that’s when it really hit me. I thought about my sisters opening their stockings without me and my parents setting the dinner table for 4 not 5. The image was upsetting, and I struggled to hold back tears. In hindsight, it was probably best that I couldn’t check Facebook or Skype home. I am pretty sure it would have made me even more homesick. I’m not suggesting you ignore your loved ones, but ‘out of sight, out of mind’ may be the best policy if you’re a bit of a softie like me! I felt guilty about breaking our family tradition by going backpacking at Christmas, and knew my absence would be felt. But being away actually helped my family do things a little differently too! Backpacking at Christmas was quite possibly one of the most humbling experiences in all my life. It has opened my eyes to the way the holidays are celebrated in other parts of the world, how it is interpreted and what it means to people. We are so conditioned into celebrating a certain way, but this has inspired me not to be scared of change and to use this time of year to give something back to people that have less. A friend of mine back in London volunteers in a shelter feeding the homeless on Christmas Day. Although I always admired her, this wasn’t something I’d ever personally considered before we went travelling. Now after spending Christmas in West Papua, this is definitely something I’d like to do in the future. It is hard being away from family and friends at this time of year. But remember that distance doesn’t separate your love for one another. This experience has taught me to really appreciate my loved ones and all the abundance we have in the Western world. I know I’ll be even more grateful next time I’m home for Christmas. Have you ever been backpacking at Christmas, or spent the holidays away from home? We’d love to hear about your experiences of celebrating Christmas across the globe and look forward to hearing from you in the comments below!